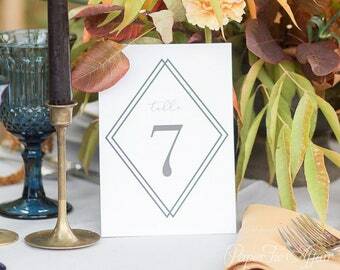 Enter the text color for your table numbers. Please refer to our color chart. Thank you! 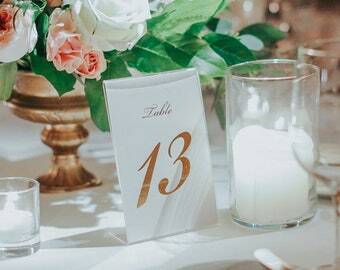 These romantic wedding table numbers feature beautiful typography, with written-out numbers. Listing photos shown with black text on our smooth white paper. 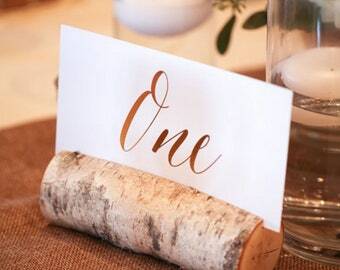 Want to add FOIL to these place cards? Contact us for a custom listing! • White Smooth: Smooth thick white paper, our house favorite; 110# cover stock. • Pearl White: Features a metallic white pearl shimmer finish; 105# cover stock. 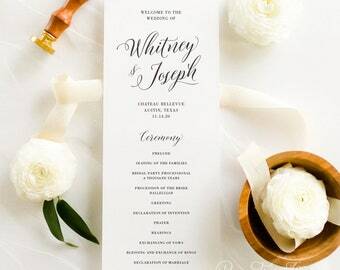 • Ivory Smooth: Smooth thick ivory paper, ideal for classic events; 110# cover stock. • Light Kraft: A natural, slightly speckled, light brown paper bag color; 110# cover stock. 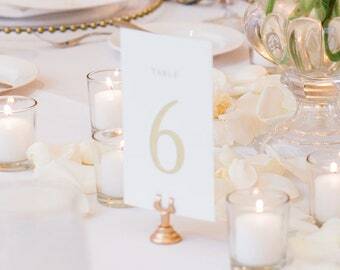 1) Leave the "Quantity" tab at 1 and select your total numbers needed under "Number of Tables"
2) Select the table number card size and paper option. 3) List a text color in the personalization box, and proceed to checkout. 4) We will personalize your order, and ship to your doorstep! 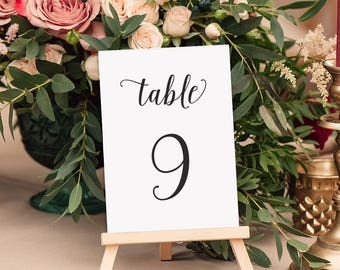 • Need a table number for your "Head Table" or "Sweetheart Table"? 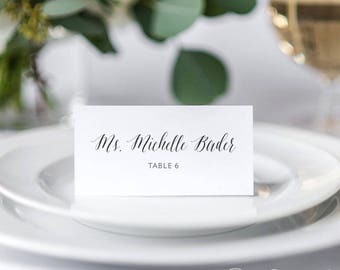 Simply select the total number of tables, and in the notes box during checkout let us know to make one with "Head Table" or "Sweetheart Table". 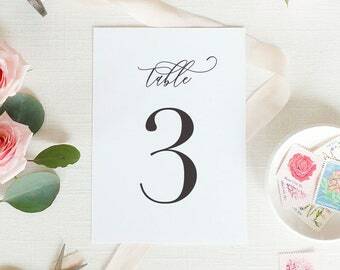 • Need double-sided table numbers? Contact us for a custom listing! 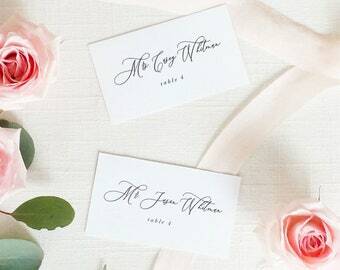 • Doing table names instead of table numbers? Contact us for a custom listing! Buy 3 or more items, and save 30% on your entire order. Applies towards different items only. 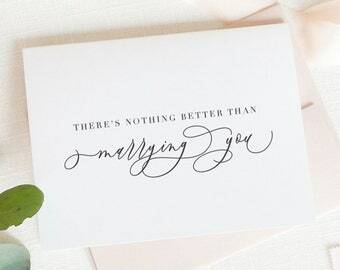 (ie: selecting a pack of 3 of the same bridesmaid cards will not be a discounted rate) Offer valid thru 4/29. PLUS receive free standard domestic shipping on all orders over $40, use code SHIPOVER40 at checkout. 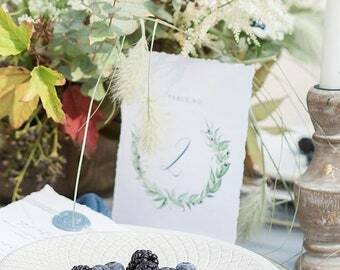 The table numbers were gorgeous, exactly as pictured and how I imagined. Delivery timeframe was as expected. 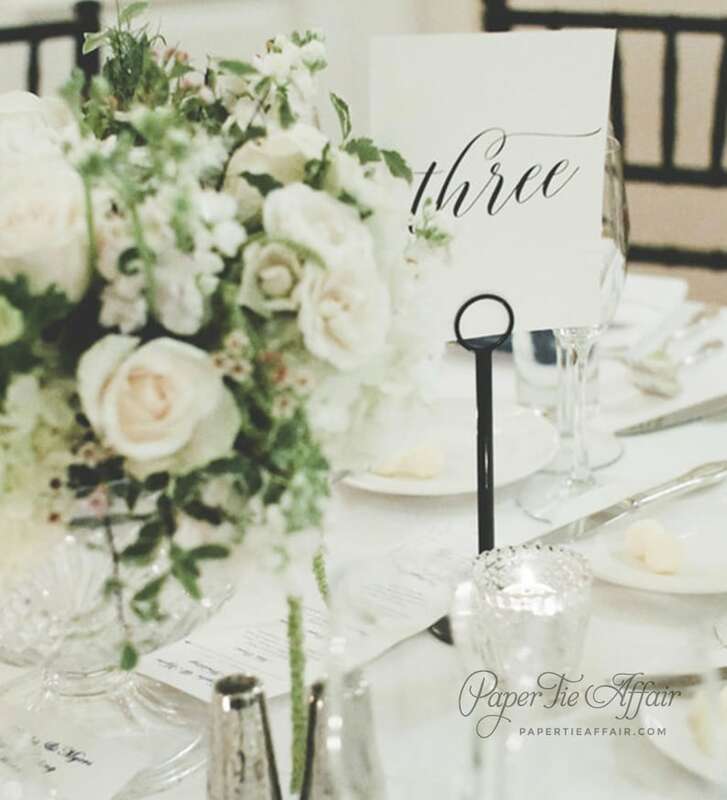 I highly recommend Paper Tie Affair for any wedding paper needs. These came out perfect! Thank you!!! Picture included from my wedding. Paper Tie Affair accepts PayPal or major credits card through Etsy's direct checkout. Texas customers will be charged sales tax. If for any reason you are dissatisfied with your purchase, please contact me immediately and I will do my best to resolve any issues. The buyer is responsible for the cost of return shipping. If your order is needed within two weeks of date of purchase, we STRONGLY recommend that you upgrade your shipping method. Even if we ship same day, we cannot guarantee that USPS will deliver the package in time. 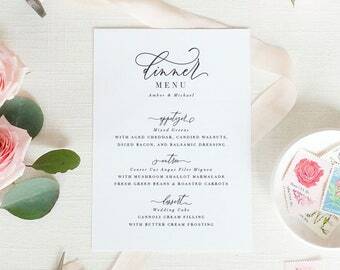 The processing time listed for each item refers to the time it takes to prepare, package, and ship your order, AFTER payment is received, or proof is approved. Orders "off the shelf" generally ship within 1-3 business days. 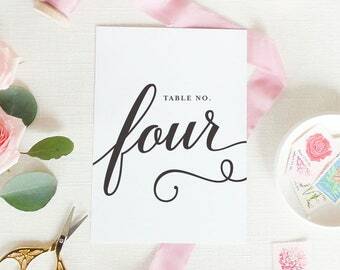 This includes items such as cards, stationery, prints, or table numbers. Please allow additional processing time for any orders that include custom/personalized items. By default, all orders ship with standard shipping USPS First Class mail. First Class parcels within the U.S. typically arrive at their destination within 7 - 10 business days of being shipped. Please keep in mind transit times vary depending on your location – we are located in Texas. Shipping upgrades are available during checkout. Priority Shipping packages should arrive within 2 - 4 business days, barring any unforeseen USPS delays. Express Shipping packages are more costly, but should arrive within 1 - 2 business days. If you are interested in any guaranteed FedEx or UPS shipping options, please contact me for a listing. We are not responsible for any additional customs tariffs or charges that your country may impose on your package, nor can we predict what they might be. We have no control over these charges and must disclose the value of your item when shipped. Paper Tie Affair is not responsible for hold-ups at customs, or postal delays that are out of our control. - If noting your event date in the buyer notes during checkout, we will do everything in our power to meet your timing. We generally have a quick turnaround, but keep in mind adding the date does not necessarily guarantee arrival; be sure to select the appropriate shipping method, and pay any rush fees (if needed), to ensure delivery. - We are not responsible for items that arrive after the date of your event. We will not provide refunds because of delays by USPS. - We are not held responsible for old or incorrect addresses provided by the customer. Please double check your address during checkout. - Once the package leaves our hands, we have the same tracking information as you and cannot provide updates beyond what is listed on the USPS tracking website. - If you become concerned your package is lost in transit or mis-delivered, please notify us and we will inquire with USPS about its status. While it is rare, if it is indeed lost due to fault of the postal carrier, we will either issue you a refund or store credit. Wholesale orders may be approved for qualifying inquiries. Please contact us by email for more information. 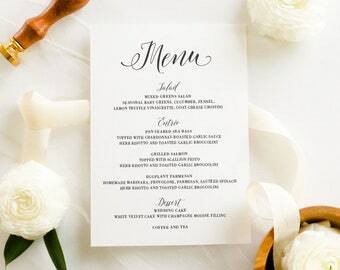 Bulk orders for weddings and parties may be considered and offered at special bulk pricing. Please inquire via email. I need my order by a specific date, which shipping upgrade should I choose? For crucial timeframes, FedEx should be chosen when your order is needed by a specific date. While the postal service (USPS) has attractive rates, these delivery times are NOT guaranteed. Please do not pick these methods when delivery dates are critical, as these packages sometimes arrive outside of the estimated timeframe.